Introduction to Protein Mass Spectrometry provides a comprehensive overview of this increasingly important, yet complex, analytical technique. Unlike many other methods which automatically yield an absolutely unique protein name as output, protein mass spectrometry generally requires a deduction of protein identity from determination of peptide fragmentation products. 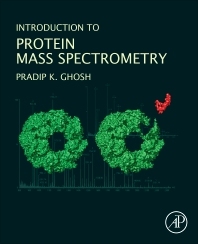 This book enables readers to both understand, and appreciate, how determinations about protein identity from mass spectrometric data are made. Coverage begins with the technical basics, including preparations, instruments, and spectrometric analysis of peptides and proteins, before exploring applied use in biological applications, bioinformatics, database, and software resources. Citing the most recent and relevant work in the field of biological mass spectrometry, the book is written for researchers and scientists new to the field, but is also an ideal resource for those hoping to hone their analytical abilities. Pradip K. Ghosh received his Ph.D. from Indiana University and did his postdoctoral research at Rice University. For most of his career he was on the faculty at the Indian Institute of Technology Kanpur, and recently taught as Visiting Professor at Pomona College and University of California Berkeley. His research specialization has been in Plasma Chemical Physics and in Mass Spectrometry. He is the author of several books, including Introduction to Photoelectron Spectroscopy (Wiley-Interscience) and Ion Traps (Clarendon Press, Oxford).